Now a couple of staff seem to have had a change to their job title. The biggest pay rise, 45% has gone to the former Strategic Lead Clean & Green who is now Street Scene Director. Same person different title. The Chief Operating Officer has now become the Assistant CEO although their pay rise is a much more modest 2%. There are a few senior officers who have had no change of title but substantial pay rises. The Strategic Director of Commissioning has had a 10% or £13,594 pay rise. 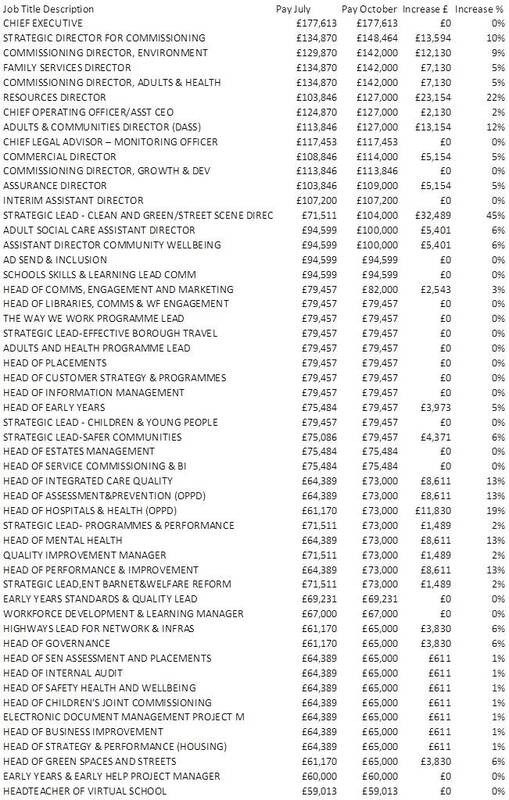 The Head of Hospitals and Health has had a rather attractive 19% pay rise while the Director of resources has had a whopping £23,154 pay rise or 22%. In the interests of balance I would also note that there are a number of staff who have had no pay rise at all including the Chief Executive. I have also used job titles only to save staff some embarrassment although all of the staff above are named in the data published here. I hear all the time how front line staff are struggling to manage following so many years of below inflation increases, pay freezes or, in the case of Your Choice Barnet staff, a pay cut, yet when I see pay rises of this magnitude I can see that the people at the top are certainly very comfortable. When Richard Cornelius attends the Question Time with the Leader event next week I for one will be asking how he can justify these massive increases. I hope lots of other people ask him similarly probing questions about how the council is being run - make sure you book your tickets here.